Tickets can be purchased in advance from Newbury Racecourse. A ticket enables you to visit all the yards open, and also attend the afternoon events in the Afternoon Events area. Buying tickets in advance is cheaper, but there will be tickets on sale at all car parks and yards on the day, and there will be plenty of room for everyone. Car Parks will open at 8a.m. Most yards open from 8.30am and are within an easy walking distance of the car parks in Lambourn. Getting Car Parking space close to the Afternoon Events field is increasingly more difficult. Car Park 4, opposite Stan Moore’s on the other side of the road, will be the first in-Lambourn Car Park to be filled. It will involve just a little more walking, for which we apologise. Please follow our attendants’ directions as to the best way to exit. The following are served by their own car parks as they are outside the centre of Lambourn: Owen Burrows, Clive Cox, Jo Davis, Nicky Henderson, Charles Hills, William Muir, Jonathan Portman and Harry Whittington. You are welcome to bring your dog provided it is kept on a lead. This is for safety reasons since there are many people about. We really want everyone to have a great time so please respect instructions from marshals and yard staff. In warm sunny weather cars become ovens, and because of this the RSPCA advises that animals are never left inside cars. If an animal left in a car is panting for breath it may be starting to suffer from heatstroke, which can kill an animal very quickly. Leaving windows open or putting a bowl of water in the car does not help. Owners who put an animal at risk by leaving it inside a locked car could face prosecution. If you see a dog left inside a parked car on a warm day, please contact the police who will be in attendance on the day or the Open Day Committee on +44 (0)7887 505211 or +44 (0)7880 734756. For any further information contact Mark Smyly by email. Approach routes, in particular from the Wantage road off Junction 14 M4, will have signs directing traffic to the various areas used on the Day. The Outside Chance Bar will sell Wine, Beer and Cider and be open on the Afternoon Events fields from noon. A live band will be playing from 4.30pm. The tent is now to be situated on the South side of the events area near the Committee, Silent Auction and raffle area, not on the North side as shown on the map in the Open Day programme. The Lambourn Tent will be situated on the South side of the Afternoon Events area near the loudspeaker van. The Silent Auction and Raffle will operate there in the afternoon. Many interesting items will be on sale there including an exclusive superb china cup with pictures of both Sprinter Sacre and Altior, a collectors item. 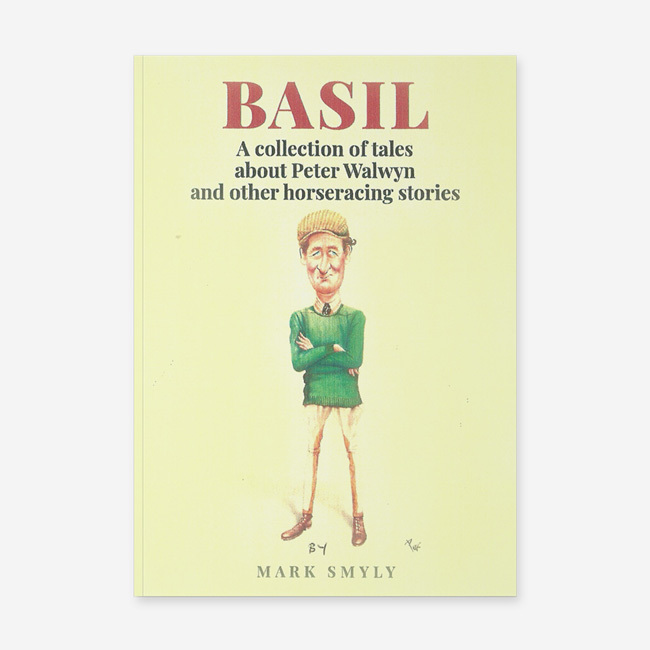 Copies of Basil, by Mark Smyly, will also be available to purchase in the Lambourn Tent for £10 each. 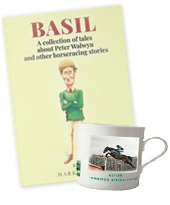 Basil is a collection of tales about Peter Walwyn and other horseracing stories. More than 60 pages including cartoon sketches and photographs, some in colour. Medical Assistance will be available on the Afternoon Events area throughout the afternoon. Requests for it should be made at the Lambourn Tent. £15 per person. Children under 12 free. Programmes will be on sale (£5) at all car parks and yards. There is a map inside, a programme of events, interesting articles, quizzes, pages of all the trainers with their horses and lots more plus many great colour photographs. A collector’s item. We have some fantastic raffle prizes at this year’s Open Day… don’t forget to buy your ticket… if you’re not in – you can’t win! 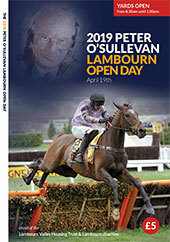 £1 or £5 per book will be available at all Trainers’ yards and at the Lambourn Tent on the Afternoon Events area. There will be some great prizes to be won. The draw will take place at approximately 4.15 p.m. on the Open Day. Andrew Lloyd Webber’s smash hit musical at London’s West end’s Gillian Lynne Theatre, Drury Lane. To be taken in 2019. Kindly donated by Lord and Lady Lloyd Webber. 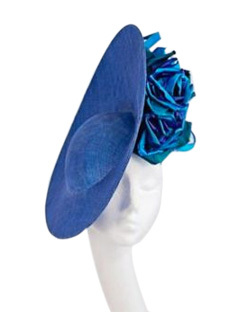 A choice of one of Lizzie’s Hats’s hats from their sale, and a free hat hire (excluding Royal Ascot). Lizzie’s Hats has over 450 beautiful hats made by designers from all over the world. Hats and headpieces are available to hire to suit any occasion. Go and choose your hat from her studio in upper Lambourn and get style advice to ensure you compliment your outfit perfectly! Kindly donated by Lizzie Hughes, wife of Lambourn trainer Richard Hughes. Kindly donated by Johnno Spence Consulting Ltd, who do a top class job to help the Lambourn Open Day with all the PR and Ben Francis, Hygrove Holdings, who generously and annually allow the use of the afternoon events field for the Open Day. Each Trainer’s yard will have at least one Silent Auction item relating to it. Bids can be made at the yard, or at the Lambourn Tent at the Afternoon Events Area until approximately 4.15 p.m. on the Open Day itself. Bids on many items can be made online on this site prior to the Open Day. Tradestands, including food outlets, will be open on the Afternoon Events area from 10 a.m. Some car parks will also have food vans; a limited number of free Racing Posts will be available there too. Horses don’t like steps either and so most of the racing yards are on level ground with tarmac or concrete walkways. The horses are generally in their stables and will often have their head out of the door, for a wheelchair user it may be difficult to view the horses who are tucked away in a far corner of the stable. However, the stables are all attended and we encourage you to ask for assistance from one of the stable lads. When you arrive at the stable please indicate that you are disabled or have a disabled passenger. Wherever safely possible you will be allowed to park close to the buildings and drop a disabled passenger. The afternoon entertainment is on a grass field which may prove challenging to wheelchair users without attendants. Parking for vehicles with disabled drivers and passengers is directly next to the field. Special toilets for disabled visitors have been hired and are available at key locations. Please ask any of the marshals. They are also marked in the Open Day programme. If you have any questions concerning facilities or access for disabled visitors then please contact us and we will do our best to assist you.